Sold by FUNUSE-AU and Fulfilled by Amazon. Gift-wrap available. ❤【TUMBLER DESIGN】: Tumbler design make it roll in a small area while playing. The dog food won’t sprinkled everywhere. 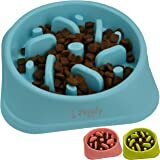 Internal special labyrinth structure and adjustable leaking hole to slow down the speed of your pet eating and protecting snacks from crushing.That way avoiding dog indigestion caused by overeating.Compare to ordinary toys greatly extend the pet hunting the difficult and time. 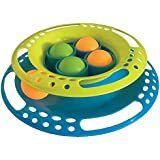 ❤【SEPARATES FOR EASY CLEANING】: Use soft foamy water to wash every part of the interactive food dispensing ball.The Official FUNUSE Q Treat Ball. Don't be fooled by imitations. FUNUSE is the only authorized seller of our brand. Look for "SOLD BY FUNUSE-AU ". Sold by FUNUSE-AU and ships from Amazon Fulfillment. Unique Patented Designs about Instinct Attraction to Dogs and Cats. ❤. 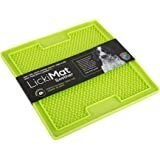 Translucent cover displays treats content with food smells which attract hungery pets and easy for you to manage leftovers. ❤. The tumbler foundation makes this dog toys stay in the same place and weaving from side to side to stimulate your pets' curiosity. ❤. A long circle way out from upper half part to final exit in the bottom of foundation make treats slower to be released. 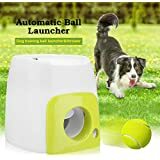 Let your smart pets enjoy more fun and play longer! Unique Patented Designs about Easier to Manage for Pet Owners. ❤. The tumbler foundation makes this toy stay in the same place, preventing it from rolling around everywhere. ❤. The simple combination of the upper half part and the foundation make the toy easier to be disassembled. ❤. Environment-friendly plastic is used for shaping the whole body, tough and odor free, safe and easy to clean. ❤. Totally four levels of adjustable treats exit allow you to control the treats depletion rate. 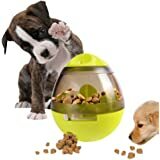 FUNUSE IQ interactive toy collections are based on food finding instinct of pets. They stimulate intellectual growth, increase daily exercise, help in training your pets both in agility and intelligence. 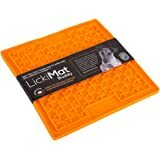 1.0 out of 5 starsMy Pooch Hated this Item - High IQ & all! My dog was terrified of this product. He is not a skittish animal, and nothing really phases him, but this freaked him out and he would not have a bar of it. We put it down to just being ‘one of those things’. We thought we would clean it out from it’s attempted try with our dog and give it to my Mother in Law to try with her dog who is also very easy going and will play with anything. Firstly, it is impossible to clean, regardless, she tried it using the same food we did. Her dog was also terrified of it. This led us to believe it was not an anomaly with our dog. I cannot in all good conscience recommended this product at all. I won’t torment an animal that’s uncomfortable by trying to force an item on it doesn’t like over and over again. I also don’t like people wasting their hard earned money like I did. Other people may have better luck than we did but I cannot recommend this product in any way at all sadly. Great in theory and my dog did enjoy playing with it, however it barely lasted 1 day! 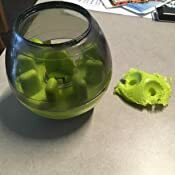 My dog was able to take the lid off and ended up chewing it to bits. Definitely not a toy to leave your dog unattended with, but will keep them occupied for a bit. 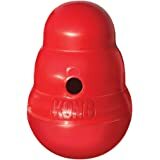 5.0 out of 5 starsBest Dog toy ever. I got this for two pugs puppies and they love it. Funny thing is they won't eat their biscuits out of their bowls. But they will spend ages trying to get the same biscuits out this little toy. Will be buying a 2nd one soon. As my kitty is a spectacular but isolated indoor cat this ball has motivated him and stimulates him to work out while also getting a treat through operant conditioning treatment to reinforce activity and mobility. 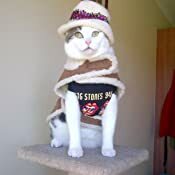 He enjoys it greatly and he can sense items are still there as he can smell the treats inside. 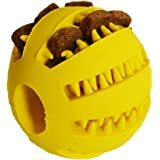 My dog loves it, but because he can fit the whole thing in his mouth he bites the top off it when its empty, to lick out the biscuit dust. Because of this I can't let him play with it without supervision. So if you have a small or medium dog this is for you. Perhaps not ideal for doberman owners like me though. This thing is awesome! 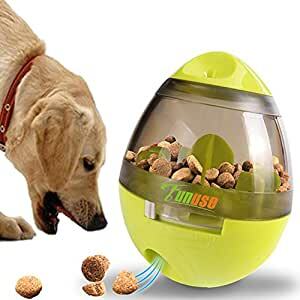 Keeps my dog entertained and she doesn't eat the food too quickly like she does from her bowl. Our toddler loves playing with it too! Could be filled with marbles for kids instead of food for dogs. Very well built, bit smaller than I was expecting but this was good because my dog can carry it around by the end. They chew on it every day without any visible wear, and it is definitely engaging for them to play with!